After a long winter spent staring out the window at leafless branches and dead, frozen grass, people welcome signs of spring – from buds appearing on flowerless stems to bugs populating the airspace – with open arms. Spring and summer present myriad opportunities to observe nature's many beautiful colors, such as an orange-winged monarch butterfly drifting across a blue sky, but it's also a time to discover subtler beauties, like that of the monarch caterpillar. There are a few reasons people go hunting for monarch caterpillars. Monitoring larvae populations is a means of predicting future strength of an area's butterfly population. A caterpillar hunt also is an educational opportunity for children and other individuals interested in learning about monarchs. In addition, monarch caterpillars are lovely creatures to behold, with interesting colors and distinct body characteristics. With four generations between hibernation, caterpillar hunting season lasts many months. The first step to monarch caterpillar identification is knowing where to find one. Monarch butterflies lay their eggs only on a caterpillar food source, and monarch caterpillars only eat one food – milkweed. Caterpillar hunters first must find some milkweed, preferably growing near or under a tree (adult monarchs prefer to roost in trees). Lift the leaves to check the underside, where caterpillars like to dine in privacy. Monarchs leave distinctive chew marks on leaves they make a meal of – they begin eating in the center part of the leaf, first skeletonizing then burrowing a hole in the milkweed. The monarch caterpillar has a distinctive color pattern of black, white and yellow that, while announcing to the larvae hunter he's located a monarch, serves as a visual message to hungry birds that they should keep looking for a meal – the monarch's milkweed diet makes him taste nasty to predators. Monarch caterpillars also have two sets of threadlike antennae, called tubercles, paired on the head and end of their bodies. 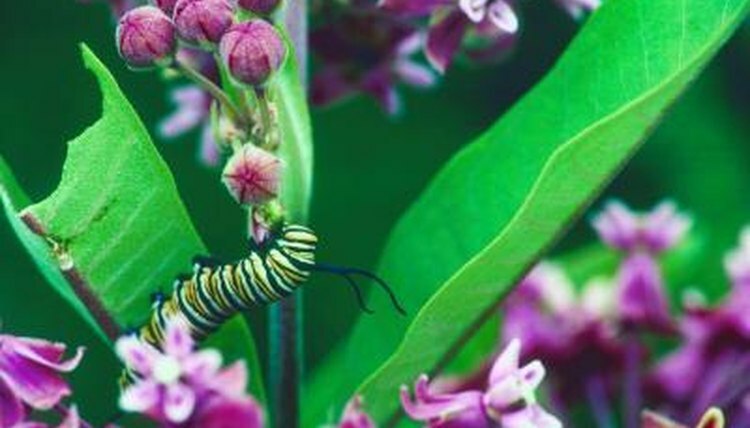 Just as in their adult stage, monarchs have imitators at the caterpillar stage as well, most notably the queen butterfly, another milkweed-munching caterpillar. While the queen's black and white color pattern appears very similar to the monarch's, the larvae has a distinctive tell when subjected to a side-by-side comparison with a monarch – it has six tubercles compared to the monarch's four, with an extra pair tagged on around the midsection. Steph's Virtual Butterfly Garden: Which Red Butterfly Do You Have?